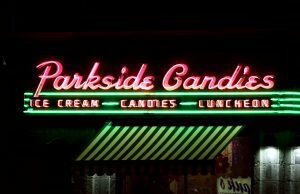 The corner of Main Street and Winspear Avenue is once again humming with the sound of neon thanks to a nearly yearlong, quarter million dollar restoration of the iconic Parkside Candy Shoppe. 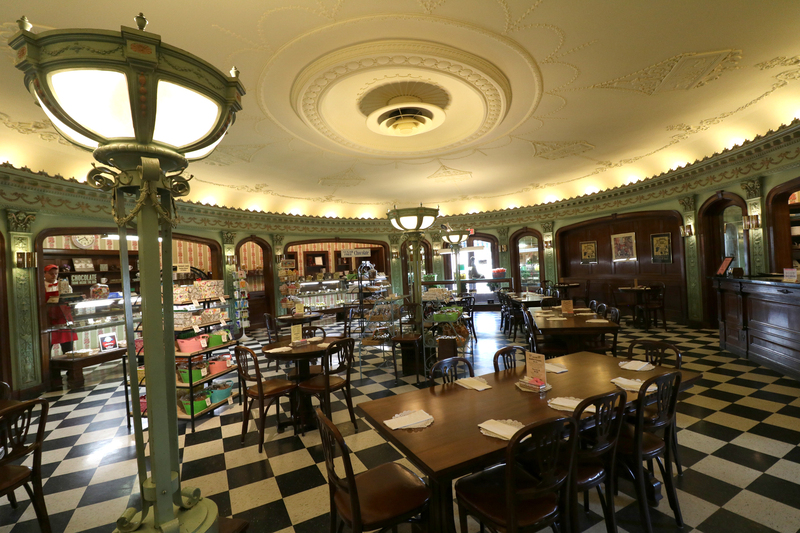 The interior of the Candy Shoppe has been restored to its original grandeur. Part of Governor Cuomo’s Buffalo Billion initiative announced in 2015, the project was made possible by a $125,000 grant awarded to the University District Community Development Association (UDCDA) by Empire State Development and New York State Homes and Community Renewal. The grant allowed the UDCDA to assist the owner, Philip Buffamonte, with an extensive restoration of both the interior and exterior of the historic landmark. 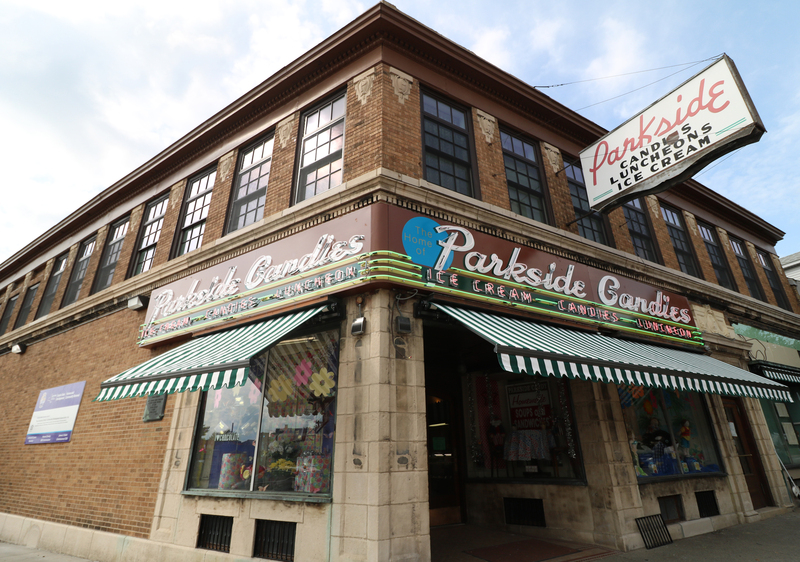 Recently listed on the National Register of Historic Places, Parkside Candy is another example of the important role state and federal historic tax credits play in revitalizing Buffalo’s neighborhoods. A press conference announcing the project’s completion will be held on Tuesday, September 26th at 2:30PM at Parkside Candy located at 3208 Main Street with a tour of all the renovated spaces to follow. Community members are also encouraged to see the renovated space for themselves at the University Heights Business Association’s October Cash Mob, which will be held at Parkside Candy from 5PM-8PM on Thursday, October 26th. Work on the iconic building began in January of this year thanks to a project team consisting of Sutton Architecture, SLR Contracting, and Preservation Studios. Work on the interior of the Candy Shoppe included painting and plaster restoration, new checkerboard flooring, restored wooden display cases, and new lighting. Two upstairs apartments have been completely remodeled, with updated bathrooms and kitchens, further adding to the number of high end units available along Buffalo’s Main Street transit corridor. The apartments have also retained much of the charm that comes with a nearly 100 year old building with original hardwood floors, trim, and fixtures throughout. 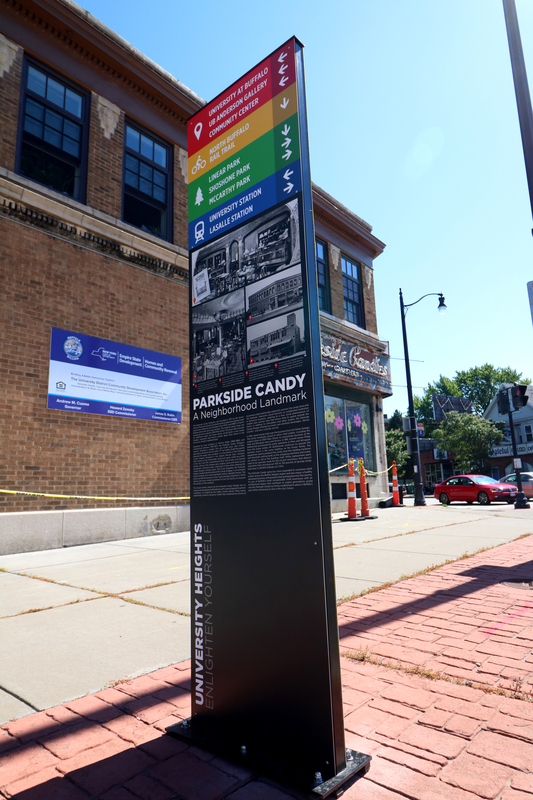 New signage tells the history of Parkside Candy and the University Heights and also provides pedestrians a wayfinding map of the neighborhood. The most noticeable work to neighborhood residents and business patrons alike, however, has been the extensive exterior restoration. This included cleaning, repairing, and repointing the building’s brick and masonry, installation of new retractable awnings, and the replacement of the business’s signature neon with a brand new replica sign. 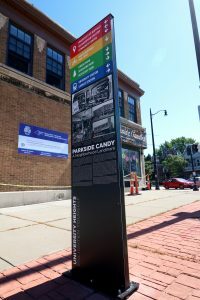 Included as part of the project was also the installation of an eight foot wayfinding sign outside the store that details the history of Parkside Candy, the University Heights, and provides pedestrians with a neighborhood walking map. As one of the oldest continuously operating small businesses in the neighborhood, the building dates back to 1925 and was designed by local architect G. Morton Wolfe. Originally owned by the Kaiser family, the retail store and adjacent factory building were built as the business outgrew its original space in the Parkside neighborhood. The business was purchased by the current owner, Philip Buffamonte, in 1981. 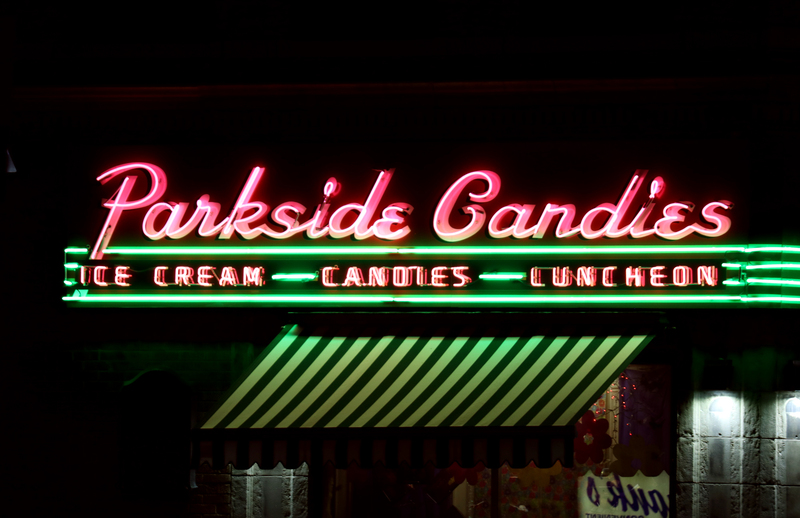 Mr. Buffamonte has committed to returning the building to its original grandeur, and sees a fully restored Parkside Candy not only as a catalyst for boosting business, but also strengthening Main Street as the vibrant and walkable heart of a resurgent University Heights.